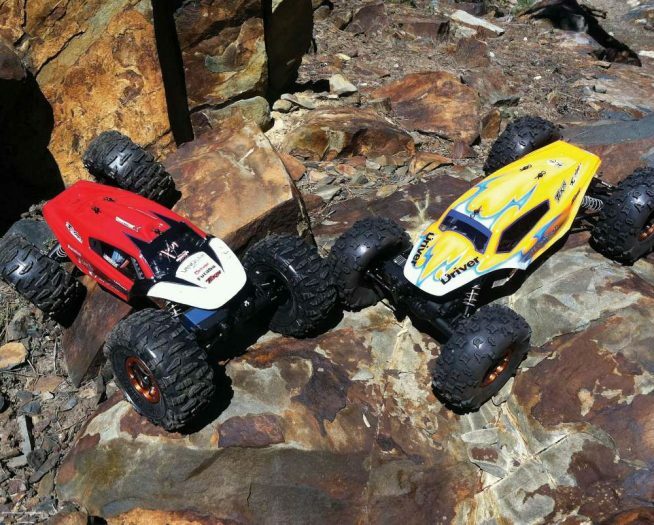 Having the right tool for the job makes all the difference and it is even the case in the RC world. Yes, you can haphazardly create some makeshift tool or use another tool that is not designed for the task at hand, but they can cause unneeded frustration and even damage to what you are working on. Not to mention the increase in the amount of time you take on the task. It is possible that you might not realize that there are RC tools out there designed to handle the specific jobs we face when building or wrenching. 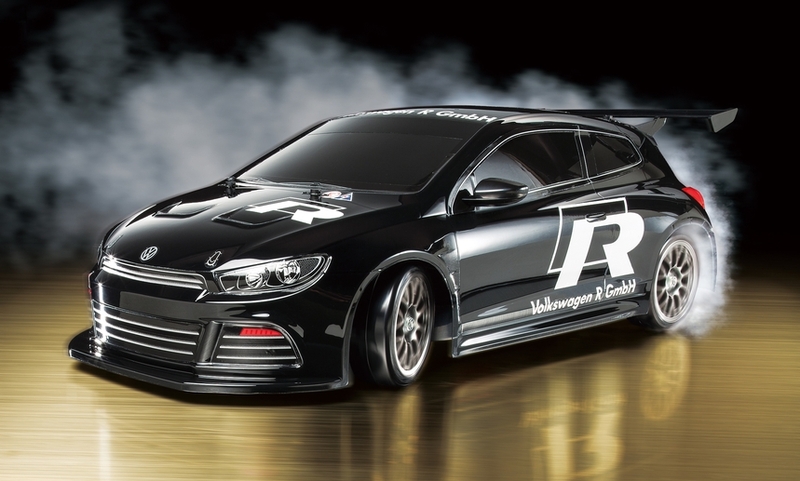 Tamiya carries a heap of different RC tools and here we will show you the Tamiya tools that you didn’t know you needed. There are several steps when building shocks for a vehicle and to make the process easier, get yourself the Tamiya TRF Damper Pliers. This small compact tool can do multiple things thanks to the number of different openings and special center post. 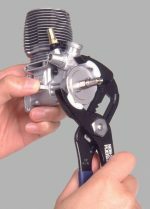 The Damper Pliers are able to hold shock shafts, can check to make sure the shafts are straight, can hold the plastic shock ends when screwing in the shock shaft, can grasp the shock body to screw on the cap and the center post is perfect for installing the damper end ball in the shock ends. The Tamiya Damper Oil Air Remover removes air quickly during shock assembly by drawing air bubbles out of the fluid by means of a vacuum. Up to four shocks with fluid can be placed in the tool. It can accept shocks with diameters of 8.9, 10.9, 12.9, or 15.9mm. 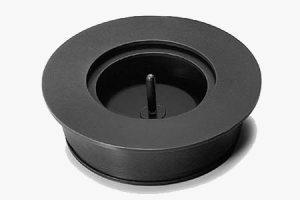 It can also be easily expanded by taking the outer cup and connecting it to the top of the inner cup so extra-long shocks with up to 3.5-inch long bodies can be used. 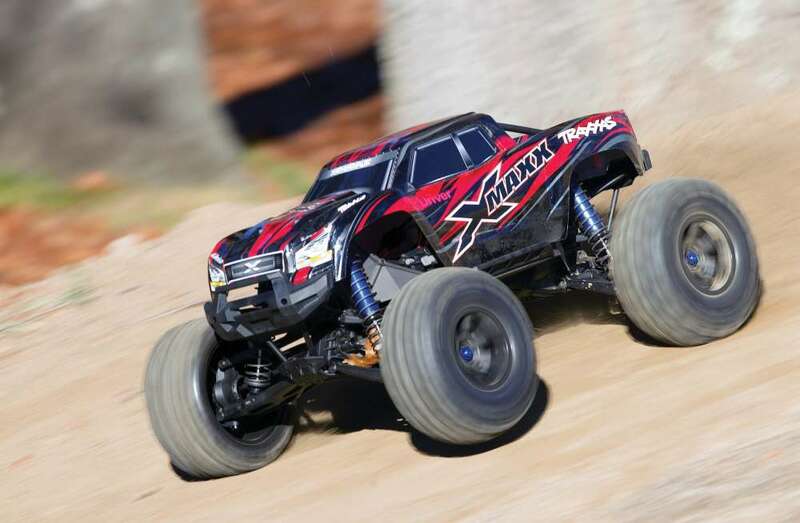 E-rings or E-clips are a commonly used fastener on most RC vehicles like on shock shafts or hinge pins. If you are familiar with them, then you know that installing them and taking them off can lead to shooting them across the room if not just exactly right. 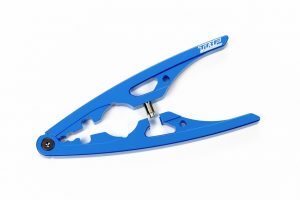 The Tamiya 2mm E-Ring Tool is extremely useful thanks to its unique shape that is specifically designed with a tip to make it easy to attach and remove the tiny E-rings. 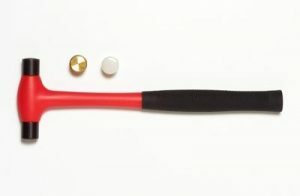 The Tamiya Micro Hammer is a small compact hammer that has a steel and reinforced plastic handle with a rubber non-slip grip, is lightweight and comes with 4 types of heads to choose from. There is a flat iron head, a round iron head, a brass head and a nylon head. The nylon and brass heads are perfect for use on items that can be damaged easily. The hammer works great for knocking stubborn flywheels off an engine or tapping hingepins into place on suspension compenents. The heads simply screw onto the hammer and Tamiya includes a case for storing the spare heads. Assembling turnbuckle links can be a bit of a pain, especially if you don’t have the correct tool for this task. The plastic link ends or adjusters are not easy to hold with your fingers when screwing them onto the turnbuckle. You can use pliers, but they can mar the adjuster and are a bit unwieldy for this job. 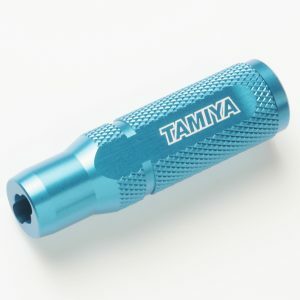 The Tamiya 5mm Adjuster Wrench is a tiny blue anodized tool that helps in a big way for assembling turnbuckles. The plastic adjuster slides into the keyed opening in the end and will securely hold the adjuster without damaging it while you screw in the turnbuckle thus making this step easier than ever. To complement the 5mm Adjuster Wrench, pick up one or both of these TRF wrenches for turnbuckles depending on the type of turnbuckles you have on your cars. They are designed to perfectly fit over the center, squared off section of the turnbuckle to make quick and easy adjustments to the links. Each come with a nicely machined aluminum handle but have different colored tips so that they can be distinguished from each other. The TRF Wrench for Blue Titanium Turnbuckle Shafts has a titanium tip for long lasting wear and works only with blue anodized titanium turnbuckles. The TRF Wrench for Aluminum Turnbuckles is meant for Tamiya aluminum and standard titanium turnbuckles. A body reamer like the Tamiya TRF RC Car Body Reamer is one of those must-have tools. It is ideal to make perfectly round holes in bodies for the body posts. Stop using a hobby knife for this task which typically leaves a jagged mess and a drill can be a hassle and not always give you a perfect hole. 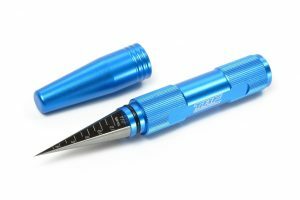 The super sharp point of this reamer ensures you start the hole in the correct spot and will be able to penetrate polycarbonate bodies. The cutting point features numbered hash marks in millimeters so that you end up with the correct size hole each and every time. Tamiya also includes an aluminum cap to protect the cutting edge and keep it safely stored. 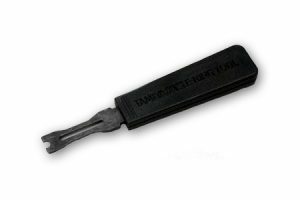 We have added these Tamiya Tweezers to our tool sets for those instances where you need to handle small parts in a tight area on a chassis or ABS body and for adding stickers to a body. Each are made of stainless steel and have a black cationic finish to make them extra durable. Their compact size are perfect for those jobs requiring precision work. 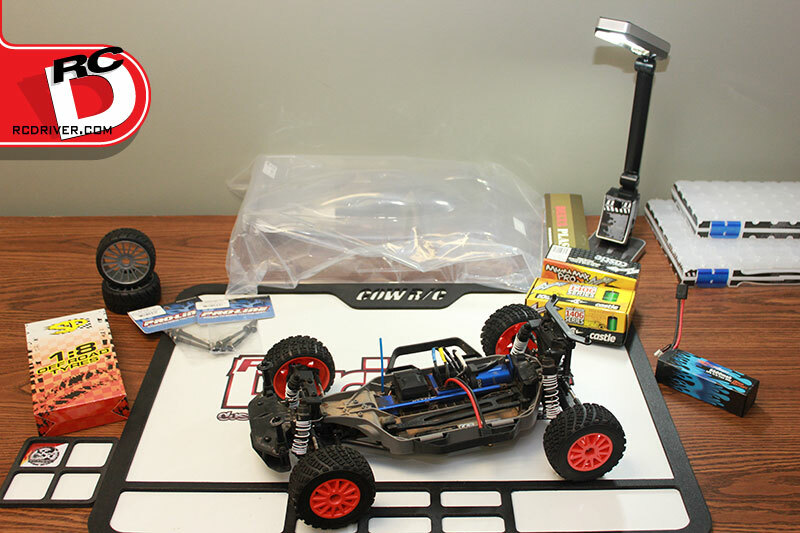 The Tamiya RC Tool Set is perfect for your pit box or to throw in your bag when you head out to bash. It has a small compact design with clear plastic cover that acts as a storage case. There are eight tools inside the set plus a handle and a convenient stand to hold each of the tools. There is a 5.5mm and 7mm nut driver, a slotted screwdriver, a No.1 and No. 2 Phillips head screwdriver and a 1.5mm, 2mm and 2.5mm hex wrenches. For extra durability, the drivers are made from Nickel chrome molybdenum steel. A coo feature of the included handle is that it can be used in two ways. You can either slide the driver into the handle to work like your typical screwdriver or you can take the driver and insert it in the opening on the side of the handle to make it a pseudo T-handle for when you need a bit more leverage. 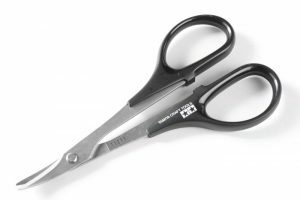 These Tamiya Curved Scissors are specifically designed for trimming polycarbonate bodies. The blades are extra sharp so that they can easily cut through the thickest polycarbonate and with their short length and curved design, they can trim out the tightest curves on a body. 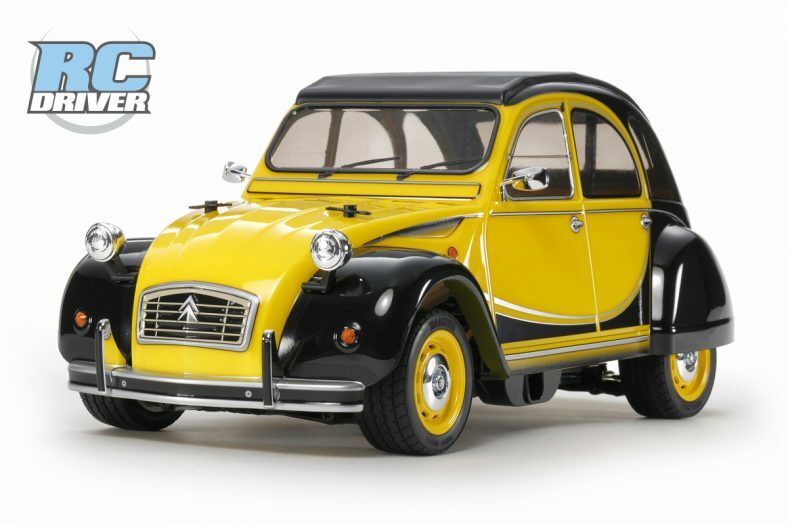 Tamiya makes them out of high quality stainless steel for exceptional durability. 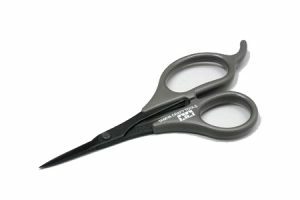 These Decal Scissors are small and compact, made of high-quality carbon steel and feature an ultra-fine point for trimming intricate decals. When used on standard vinyl stickers, they will dull faster, but we feel it is worth it to be able to accurately cut out super small stickers. They measure 5-inches long with plastic handles that fit nicely to your fingers. The black surface of the blades resists sticking to adhesives so they won’t get hung up while cutting and are incredibly sharp for precise cuts. An added bonus with these scissors is that they work incredibly well for trimming flash off of rubber tires or for modifying race tires. The precision of these scissors allow racers to build a tire for a unique track condition. 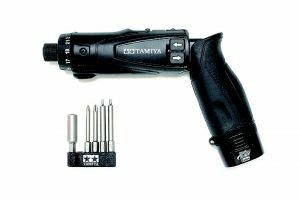 Electric screwdrivers are no secret but most people don’t realize that Tamiya offers one for RC. The Electric Screwdriver Set (PT01) is an awesome tool to get if you have the funds for it. It comes in handy for assembling and disassembly a kit. It features 21 adjustable torque settings with a clutch so that you don’t overpower a fastener into the chassis. It can be used in either a pistol grip formation or straight, includes a bright LED light to illuminate what you are working on, has a forward/revers switch as well as a high/low speed select lever. 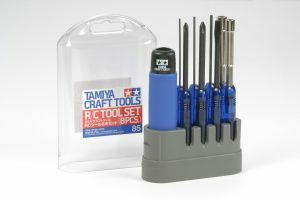 Tamiya includes five screwdriver bits and a soft storage case. A 7.2V Lithium-ion battery with charger is used to power the screwdriver. The next step up from your ordinary tweezers are these Tamiya Needle Nose pliers. They feature long and super slim jaws made of chromium-vanadium steel and offer superb grip. Their design allows them to reach tight confined spaces and work on delicate components. At the base of the jaws is a handy cutter and the handles feature a non-slip PVC grip. For items that you don’t want to get scratched, use these Non-Scratch Long Nose Pliers instead of your standard metal jaw pliers. 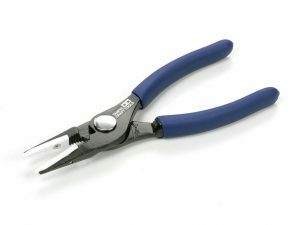 Plastic grips are screwed onto the jaws to cover the serrated teeth of the pliers and will protect the part being worked on while maintaining a firm grip. 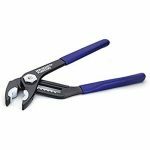 The pliers are constructed of steel and feature coated handles, a 2-step opening adjustment and the jaw is spring loaded for added convenience. These Non-Scratch Pliers from Tamiya are great for protecting parts from being scratched while you work on your car. Plastic grips cover the metal jaws and securely grasp the part you are working and protect it from damage. Its ideal use is for holding a flywheel stationary during clutch assembly. The spring loaded jaws feature an 8-step adjustment and can open to a maximum width of 46mm. 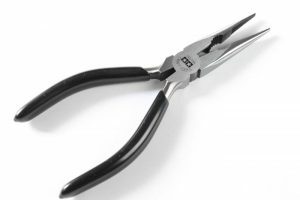 The plastic grips can be easily removed to use the pliers in the normal way. The Tamiya Sharp Pointed Side Cutter is by far one of our favorite tools and is one we would not want to live without. The main task for this tool is for cutting plastic parts off of sprue. They feature PVC non-slip grips and convenient return spring. Also known as flush cutters, this tool will separate a part from the parts tree and leave a clean edge. 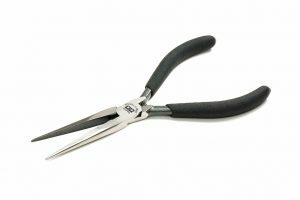 These sharp pointed side cutters are the best because they have slim, super sharp jaws that offer surgical precision and eliminate the need to go back and trim flash after you cut the part. 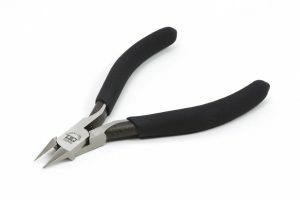 Side cutters are one of those tools that once you own a pair you won’t know how you got by without them. Although these two screwdrivers look like your ordinary Phillips drivers, they are a bit different and are ideal when building or wrenching on Tamiya cars. They feature a high-precision CNC machine end to prevent damage to screw heads. They will work on your typical Phillips screws, but are designed to fit perfectly with JIS (Japanese Industrial Standard) screws which are used in Tamiya kits. Your ordinary Phillips screwdrivers will have a tendency to cam out and possibly damage the screw. These drivers will fit perfectly in the Tamiya hardware. Each have an ergonomically designed 2-color polypropylene and elastomer grip which is comfortable in your hand and offers full control of the tool. The L-model is for PH2 (3-5mm; JIS M3-M5) and the M-model is for PH1 (2-2.6mm; JIS M2-2.6). The Tamiya RC Tire Cementing Helper is made for standard touring car tires and Tamiya M-chassis tires. It makes the tire gluing process much easier and less messy. When the tire is placed inside, you press down on the outer ring which creates a nice gap between the tire and wheel and allows you to easily run a smooth and consistent flow of instant glue into that gap to make for a secure bond. It also keeps the instant glue from getting on to your fingertips.